A classic Italian vineyard scene, with vines growing together with olive trees. Vineyards around the town of Barolo. Vini IGP (Wines with Protected Geographical Indication): This category (also traditionally implemented in Italy as IGT - Typical Geographical Indication) is reserved to wines produced in a specific territory within Italy and following a series of specific and precise regulations on authorized varieties, viticultural and vinification practices, organoleptic and chemico-physical characteristics, labeling instructions, etc. Currently (2016) there exist 118 IGPs/IGTs. Vini DOP (Wines with Protected Designation of Origin): This category includes two sub-categories, i.e. Vini DOC (Controlled Designation of Origin) and Vini DOCG (Controlled and Guaranteed Designation of Origin). DOC wines must have been IGP wines for at least 5 years. They generally come from smaller regions, within a certain IGP territory, that are particularly vocated for their climatic and geological characteristics and for the quality and originality of the local winemaking traditions. 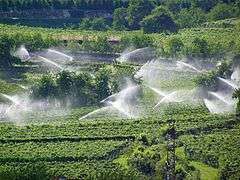 They also must follow stricter production regulations than IGP wines. A DOC wine can be promoted to DOCG if it has been a DOC for at least 10 years. In addition to fulfilling the requisites for DOC wines (since that's the category they come from), before commercialization DOCG wines must pass stricter analyses, including a tasting by a specifically appointed committee. DOCG wines have also demonstrated a superior commercial success. Currently (2016) there exist 332 DOCs and 73 DOCGs for a total of 405 DOPs. The extensive mountains and foothills provide many altitudes for grape growing and a variety of climate and soil conditions. 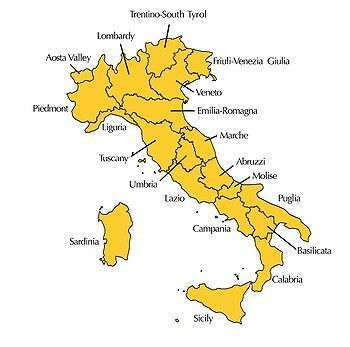 Italy's twenty wine regions correspond to the twenty administrative regions. Understanding of Italian wine becomes clearer with an understanding of the differences between each region; their cuisines reflect their indigenous wines, and vice versa. The 73 DOCG wines are located in 15 different regions but most of them are concentrated in Piedmont, Veneto and Tuscany. Among these are appellations appreciated and sought after by wine lovers around the world: Barolo, Barbaresco, and Brunello di Montalcino (colloquially known as the "Killer B's"). Other notable wines that in the latest years gain much attention in the international markets and among specialists are: Amarone della Valpolicella, Prosecco di Conegliano- Valdobbiadene, Taurasi from Campania, Franciacorta sparkling wines from Lombardy; evergreen wines are Chianti and Soave, while new wines from the Centre and South of Italy are quickly gaining recognition: Verdicchio, Sagrantino, Primitivo, Nero D'Avola among others. The Friuli-Venezia Giulia is world-famous for the quality of her white wines, like Pinot Grigio. Special sweet wines like Passitos and Moscatos, made in different regions, are also famous since old time. Italy's Ministry of Agriculture and Forestry (MIPAAF), has documented over 350 grapes and granted them "authorized" status. There are more than 500 other documented varieties in circulation as well. The following is a list of the most common and important of Italy's many grape varieties. Arneis: A variety from Piedmont, which has been grown there since the 15th century. Catarratto: Common in Sicily—this is the most widely planted white variety in Salaparuta. Fiano: Grown on the southwest coast of Italy. Friulano: A variety also known as Sauvignon Vert or Sauvignonasse, it yields one of the most typical wines of Friuli. The wine was previously known as Tocai but the name was changed by the EC to avoid confusion with the Tokay dessert wine from Hungary. Garganega: The main grape variety for wines labeled Soave, this is a dry white wine from the Veneto wine region of Italy. It is popular in northeast Italy around the city of Verona. Currently, there are over 3,500 distinct producers of Soave. Greco di Tufo: Grown on the southwest coast of Italy. Malvasia bianca: A white variety that occurs throughout Italy with many clones and mutations. Moscato blanc: Grown mainly in Piedmont, it is mainly used in the slightly-sparkling (frizzante), semi-sweet Moscato d'Asti. Not to be confused with Moscato Giallo and Moscato rosa, two Germanic varietals that are grown in Trentino Alto-Adige. Nuragus: An ancient Sardinian variety found in southern Sardegna, producing light and tart wines consumed as an apertifs. Passerina: mainly derives from Passerina grapes (it may even be produced purely with these), plus a minimum percentage of other white grapes and may be still, sparkling or passito. The still version has an acidic profile, which is typical of these grapes. Pecorino: Native to Marche and Abruzzo, it is used in the Falerio dei Colli Ascolani and Offida DOC wines. It is low-yielding, but will ripen early and at high altitudes. Pecorino wines have a rich, aromatic character. Pigato: An acidic variety from Liguria, the wines are vinified to pair with seafood. Pinot grigio: A successful commercial grape (known as Pinot Gris in France), its wines are characterized by crispness and cleanness. The wine can range from mild to full-bodied. Ribolla Gialla: A Greek variety introduced by the Venetians that now makes its home in Friuli. Trebbiano: This is the most widely planted white varietal in Italy. 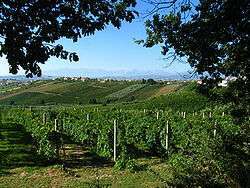 It is grown throughout the country, with a special focus on the wines from Abruzzo and from Lazio, including Frascati. Trebbiano from producers such as Valentini have been known to age for 15+ years. It is known as Ugni blanc in France. Verdicchio: This is grown in the areas of Castelli di Jesi and Matelica in the Marche region and gives its name to the varietal white wine made from it. The name comes from "verde" (green). In the last few year Verdicchio wines are considered to be the best white wines of Italy. Vermentino: This is widely planted in Sardinia and also found in Tuscan and Ligurian coastal districts. The wines are a popular accompaniment to seafood. Other important whites include Carricante, Coda de Volpe, Cortese, Falanghina, Grechetto, Grillo, Inzolia, Picolit, Traminer, Verduzzo, and Vernaccia. Non-native varieties include Chardonnay, Gewürztraminer (sometimes called traminer aromatico), Petite Arvine, Riesling, Sauvignon blanc, and others. Aglianico del Vulture: Based on the Aglianico grape produced in the Vulture area of Basilicata. It was recognized as DOC in 1971 and DOCG in 2011. Aglianico: Considered the "noble varietal of the south", it is primarily grown in Basilicata and Campania. The name is probably derived from Hellenic, so it is considered a Greek transplant. The fruit is thick skinned and spicy fruit. Barbera: The most widely grown red wine grape of Piedmont and Southern Lombardy, most cultivated around the towns of Asti, Alba, and Pavia. Barbera wines were once considered simply "what you drank while waiting for the Barolo to be ready", but with a new generation of wine makers this is no longer the case. The wines are now meticulously vinified: in the Asti region Barbera grapes are used to make "Barbera d'Asti Superiore", which may be aged in French barriques to become Nizza, a quality wine aimed at the international market. The vine has bright cherry-coloured fruit, and its wine is acidic with a dark color. Corvina: Along with the varietals Rondinella and molinara, this is the principal grape which makes the famous wines of the Veneto: Valpolicella and Amarone. Valpolicella wine has dark cherry fruit and spice. After the grapes undergo passito (a drying process), the wine is now called Amarone, and is high in alcohol (16% and up) and characterized by raisin, prune, and syrupy fruits. Some Amarones can age for 40+ years and command spectacular prices. In December 2009, there was celebration when the acclaimed Amarone di Valpolicella was finally awarded its long-sought DOCG status. The same method used for Amarone is used for Recioto, the oldest wine produced in this area, but the difference is that Recioto is a sweet wine. Dolcetto: A grape that grows alongside Barbera and Nebbiolo in Piedmont, its name means "little sweet one", referring not to the taste of the wine, but the ease in which it grows and makes good wines suitable for everyday drinking. Flavors of concord grape, wild blackberries, and herbs permeate the wine. Malvasia nera: Red Malvasia varietal from Piedmont. A sweet and perfumed wine, sometimes elaborated in the passito style. Montepulciano: Not to be confused with the Tuscan town of Montepulciano; it is most widely planted grape on the opposite coast in Abruzzo. Its wines develop silky plum-like fruit, friendly acidity, and light tannin. More recently, producers have been creating a rich, inky, extracted version of this wine, a sharp contrast to the many inferior bottles produced in the past. Nebbiolo: The most noble of Italy's varieties. The name (meaning "little fog") refers to the autumn fog that blankets most of Piedmont where Nebbiolo is chiefly grown, and where it achieves the most successful results. A difficult grape variety to cultivate, it produces the most renowned Barolo and Barbaresco, made in the province of Cuneo, along with the lesser-known Sforzato, Inferno and Sassella made in Valtellina, Ghemme and Gattinara, made in Vercelli's province. Traditionally produced Barolo can age for fifty years-plus, and is regarded by many wine enthusiasts as the greatest wine of Italy. Negroamaro: The name literally means "black bitter". A widely planted grape with its concentration in the region of Puglia, it is the backbone of the Salice Salentino. Nero d'Avola: This once-obscure native varietal of Sicily is gaining attention for its fruit and sweet tannins. The quality of Nero d'Avola has surged in recent years. Primitivo: A red grape planted found in southern Italy, most notably in Apulia. Primitivo ripens early and thrives in warm climates, where it can achieve very high alcohol levels. It is known as Zinfandel in California. Sagrantino: A native of Umbria, it is planted on only 250 hectares, but the wines produced from it (either blended with Sangiovese as Rosso di Montefalco or as a pure Sagrantino) are world-renowned. These wines can age for many years. Sangiovese: Italy's claim to fame, the pride of Tuscany. 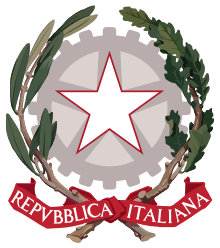 It produces Chianti (Classico), Rosso di Montalcino, Brunello di Montalcino, Rosso di Montepulciano, Montefalco Rosso, and many others. Sangiovese is also the backbone in many of the acclaimed, modern-styled "Super-Tuscans", where it is blended with Bordeaux varietals (Cabernet Sauvignon, Merlot, and Cabernet Franc) and typically aged in French oak barrels, resulting in a wine primed for the international market in the style of a typical California cabernet: oaky, high-alcohol, and a ripe, fruit-forward profile. Other major red varieties are Cannonau, Ciliegolo, Gaglioppo, Lagrein, Lambrusco, Monica, Nerello Mascalese, Pignolo, Refosco, Schiava, Schiopettino, Teroldego, and Uva di Troia. The term "Super Tuscan" is a term (mostly used in the wine Anglosphere and virtually unknown in Italy) that describes any wine (mostly red, but sometimes also white) produced in Tuscany and that generally does not adhere to the traditional local DOC(G) regulations. As a result, Super Tuscans are usually Toscana IGT wines, while others are Bolgheri DOC, a designation of origin rather open to international grape varieties. 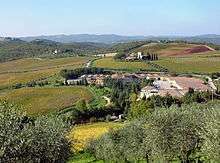 Instead, traditional Tuscan DOC(G)s require that wines are made from native grapes and mostly Sangiovese. While sometimes Super Tuscans are actually produced by Sangiovese alone, they are also often obtained by (1) blending Sangiovese with international grapes (such as Cabernet Sauvignon, Merlot, Cabernet Franc, Syrah), (2) blending international grapes alone (especially classic Bordeaux grapes for reds; Chardonnay and Sauvignon blanc for whites), or (3) using one single international variety. In a sense, red Super Tuscans anticipated the Meritage, a well-known category of international Bordeaux-style reds of US origin. Although an extraordinary amount of wines claim to be “the first Super Tuscan,” most would agree that this credit belongs to Sassicaia, the brainchild of marchese Mario Incisa della Rocchetta, who planted Cabernet Sauvignon at his Tenuta San Guido estate in Bolgheri back in 1944. It was for many years the marchese’s personal wine, until, starting with the 1968 vintage, it was released commercially in 1971. In 1968 Azienda Agricola San Felice produced a Super Tuscan called Vigorello, and in the 1970s Piero Antinori, whose family had been making wine for more than 600 years, also decided to make a richer wine by eliminating the white grapes from the Chianti blend, and instead adding Bordeaux varietals (namely, Cabernet Sauvignon and Merlot). He was inspired by Sassicaia, of which he was given the sale agency by his uncle Mario Incisa della Rocchetta. The result was one of the first Super Tuscans, which he named Tignanello, after the vineyard where the grapes were grown. What was formerly Chianti Classico Riserva Vigneto Tignanello, was pulled from the DOC in 1971, first eliminating the white grapes (then compulsory in Chianti DOC) and gradually adding French varieties. By 1975, Tignanello was made with 85% Sangiovese, 10% Cabernet Sauvignon, and 5% Cabernet Franc, and it remains so today. Other winemakers started experimenting with Super Tuscan blends of their own shortly thereafter. Because these wines did not conform to strict DOC(G) classifications, they were initially labeled as vino da tavola, meaning "table wine," an old official category ordinarily reserved for lower quality wines. 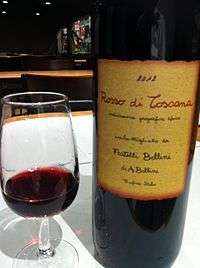 The creation of the Indicazione Geografica Tipica category (technically indicating a level of quality between vino da tavola and DOC(G)) in 1992 and the DOC Bolgheri label in 1994 helped bring Super Tuscans "back into the fold" from a regulatory standpoint. Since the pioneering work of the Super Tuscans, there has been a rapid expansion in production of high-quality wines throughout Italy that do not qualify for DOC or DOCG classification, as a result of the efforts of a new generation of Italian wine producers and, in some cases, flying winemakers. Many international wine guides and wine publications rate the most popular Italian wines. Among the Italian publications, Gambero Rosso is probably the most influential. In particular, the wines that are annually given the highest rating of "three glasses" (Tre Bicchieri) attract much attention. Recently, other guides, such as Slow Wine, published by Slow Food Italia, and Bibenda, compiled by the Associazione Italiana Sommelier (AIS), have also gained attention both among professionals and amateurs. Slow Wine has the interesting feature of reporting on several wineries (small and medium) that genuinely represent the territory and on products that are especially interesting for their price/quality ratio (Vini Slow and Vini Quotidiani). Vino cotto (literally cooked wine) is a form of wine from the Marche and Abruzzo in Central Italy. It is typically made by individuals for their own use as it cannot legally be sold as wine. The must, from any of several local varieties of grapes, is heated in a copper vessel where it is reduced in volume by up to a third before fermenting in old wooden barrels. It can be aged for years, barrels being topped up with each harvest. It is a strong ruby-colored wine, somewhat similar to Madeira, usually drunk with sweet puddings. Vincotto, typically from Apulia, also starts as a cooked must but is not fermented, resulting in a sweet syrup suitable for the preparation of sweets and soft drinks. Once reduced and allowed to cool it is aged in storage for a few years. 1 2 "Wine". Retrieved 2 June 2016. ↑ Mulligan, Mary Ewing and McCarthy, Ed. Italy: A passion for wine. Indiana Beverage Journal, 2006. ↑ Speller, Walter (26 March 2013). "Kerin O'Keefe's Montalcino subzones". JancisRobinson.com. ↑ "Please login". Retrieved 2 June 2016. ↑ "Nero d'Avola - Best of Sicily Magazine". Retrieved 2 June 2016. ↑ "California Cabernet Wine". Retrieved 2 June 2016. 1 2 O'Keefe, Kerin (2009). "Rebels without a cause? The demise of Super-Tuscans" (PDF). The World of Fine Wine (23): 94–99.